The Barnes Museum is a precious escape from the beautiful, majestic City Center of Philadelphia, where one feels wondrously imprinted upon them a feeling of American glory. A feeling of virtue and nobility for the struggle and successful achievement of an ideal history writ. In it’s marvelous pseudo-Jerusalem stone architecture holds an impressive collection of the crown jewels of Impressionism and early 20th century art from the Masters of their respective ages. It would be thought of by a cynic as warlock booty from a conquered land because of this ubiquity of beauty. 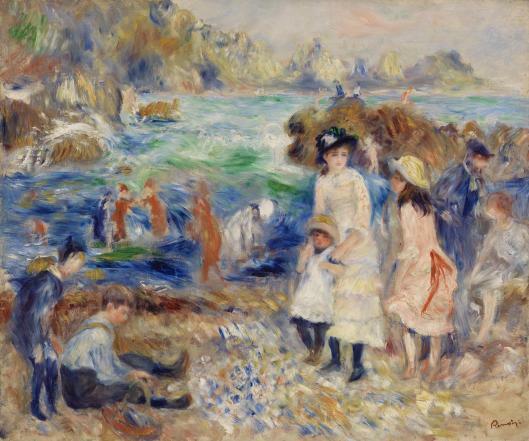 And it is no hyperbole to suggest that some of Renoir’s finest paintings of the quotidian life, of making precious the gentleness of harmonic living of mothers and their children, the centerfold examination of love if there ever was any, are housed here. In here, there is his crushing mastery of blue. Which may seem paradoxical, as the color of vividness would be thought of as red. Yet what must have been years of intricate study in perfecting the ecstatic exquisiteness of light reflecting onto color – the purification of iridescence if you will – by Renoir has him layer his blues in such a manner they absolutely sparkle, giving one eyesight where one was just before blind. This is revealed to us with his Children at the Seashore, with bringing forth into being a royal blue, shaded and encrusted by a kaleidoscopic wheel of other light forms, that is sublimity. Renoir has this effect on me personally. And it would not be mistaken to suggest that he is the inspiration for my On the Necessity of Colors in the Fine Arts, with the argument there being the necessity for such drunken bludgeon of color. After all, this is the sacred grounds which the fine arts have not relented to the scourge of commodified artistry. But then there is Matisse, ever so gracefully placed in such tastefully decorative manner. So modestly his works are illuminated. For they do not need artificial light to brighten them. They are bright as-is! For that was his creed. It is charming then how the permanent collection at the Barnes Museum is such an assembly, and armory, of the sanguinity of the 19th and early 20th century. What provoked simultaneously the works of a Jules Verne, a Herman Melville, a Hans Christian Anderson – all with the nursing of man’s vigor, his lust to devour the unknown for that is his permanent state of being; to be within it. To celebrate it! Not everything is perfect though. And with the Barnes, their refusal to permit the photographing of their artworks, to allow others in the world to see what my mere words can unjustly describe, is plain immoral. Such beauties of the world, which taste gorgeous whether one was alive now, a millennium from now, or a millennium from before now; true service to human culture must be allowed to be diffused into the world. For the world can never have too much sweetness and light.